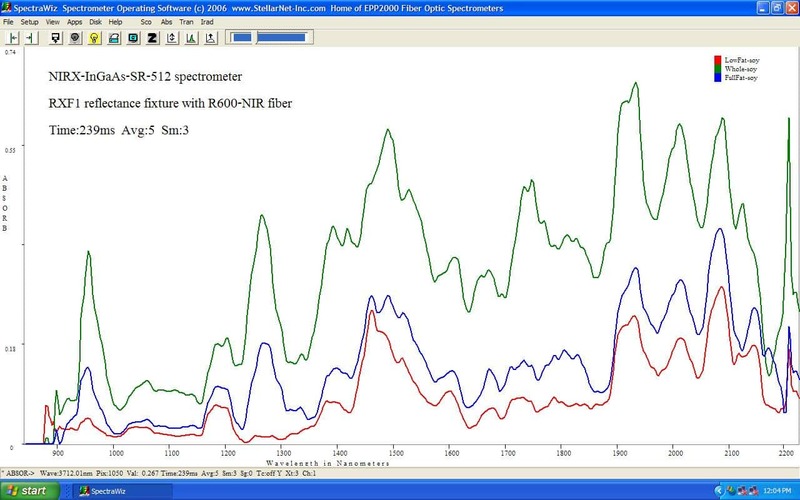 RED-Wave-NIRX-SR InGaAs 512 pixels spectrum showing spectral characteristics of Tylenol, Excedrin PM, and Ibuprofen tablets. 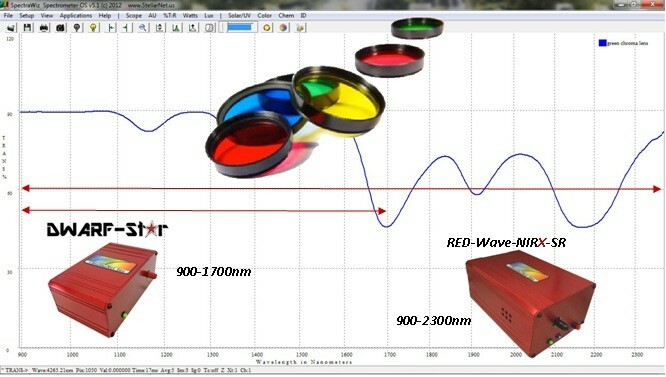 Often NIR spectroscopy is used as a non-contact method to distinguish between coatings. 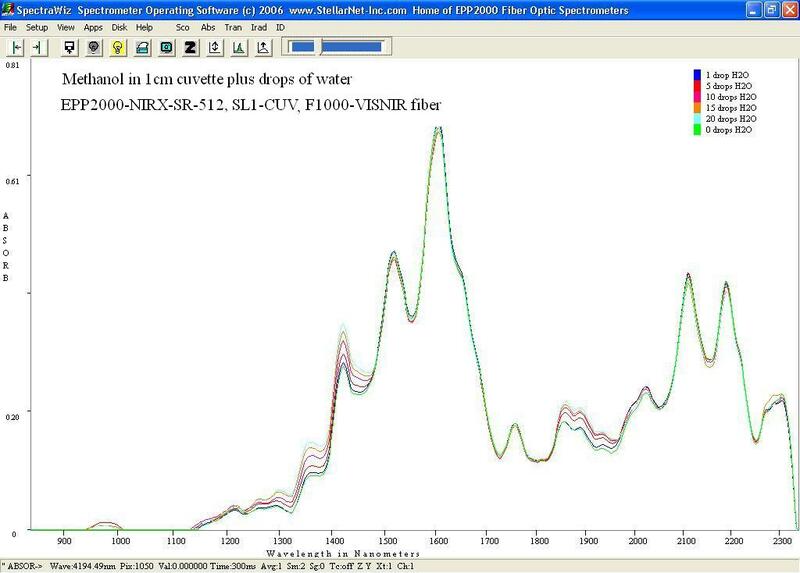 1000um diameter fiber optic cable measuring the NIR absorption of methanol in water. 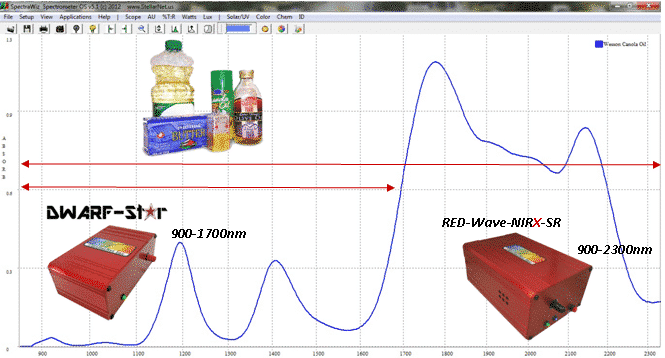 RED-Wave-NIRX-SR spectrometer with RFX1 reflectance fixture plotting NIR 2nd derivative spectra of soy products with varying fat content. Lens, filters, films, coatings, and plastics sometimes will have interesting characteristic fringe patterns in the far NIR. Be sure to test your samples! fiber optic cables measuring the transmission through PTFE and Lexan plastics. 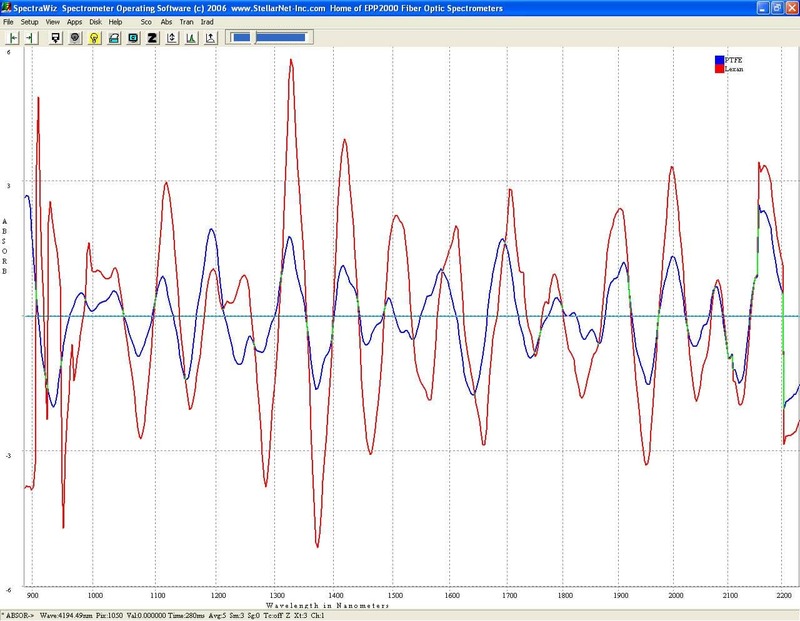 Above SpectraWiz spectroscopy software displays 2nd derivative spectra in real time. 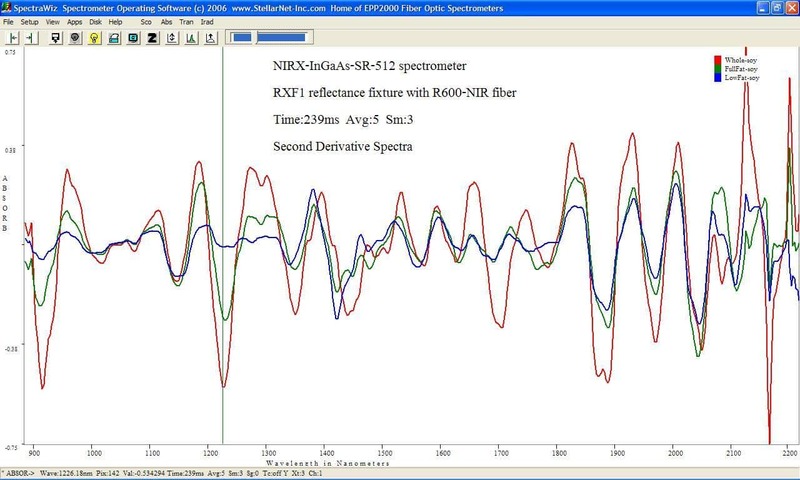 diameter fiber optic cable measuring the NIR absorption of oil and alcohol solutions. showing important spectral features past 1700nm such as Fatty Acids absorbance bands at 1750nm and oil saturation absorbance at 2100nm. 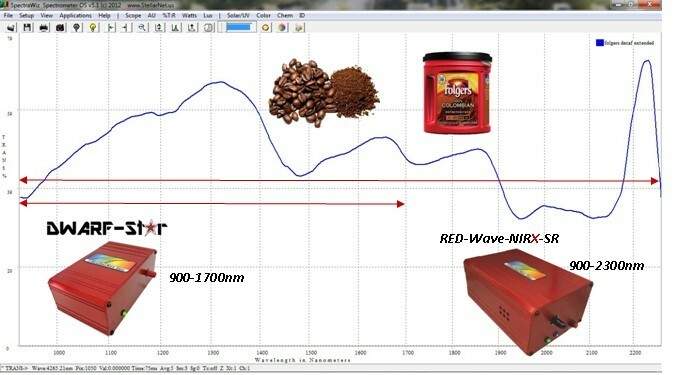 Coffee in addition to many other agricultural products shows very important spectral characteristics past 1700nm. Commercial coffee is mainly made up of two main blends, Arabica and Robusta. Main distinguishing absorptions can be found from water content (1466nm and 1962nm) and lipids. 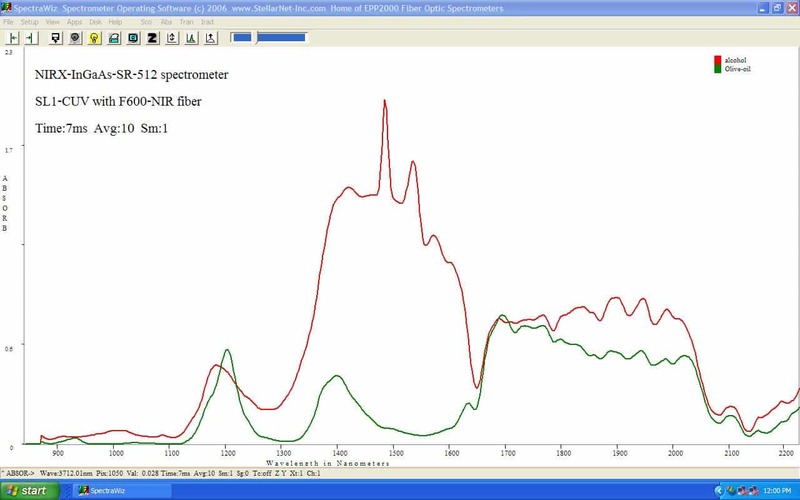 NIR spectroscopy can be used for classification as well as blending. Also, caffeine and dry matter content can be determined. For food quality control and identification of adulterants it is very important to test all parts of the NIR region.